In today’s climate I-9 compliance is imperative, regardless of the size of the business. Yet most employers are not in compliance and at risk. Lookout’s I-9 program can help get you compliant and keep you compliant. Don’t wait for the audit and ICE fines. At your option, Lookout Services seamlessly integrates with the federal government’s E-Verify program. With Lookout software E-Verify is at your fingertips and a cinch. Lookout provides the largest suite of tools to help your business get compliant and stay compliant. Our software was developed by attorneys to solve compliance issues and avoid ICE fines. Being compliant has never been so easy. Our solutions cover a wide variety of businesses and industries and helps each avoid costly ICE fines. Our attorneys designed our solutions with your business in mind. ICE has multiple criteria for leveraging fines for I9 compliance issues, and although fines may vary, use our potential ICE fine calculator below to determine your risk. Learn how ICE Determines fines and why having I9 compliance software is a must for any business. Not sure if you are compliant? We can help. We can do a sample simulated audit so you know where you stand. Learn if you have a problem before large fines are attached to the results. Being compliant in your I9 reporting starts with how you fill in and complete the form. But once complete there is an entire document retention requirement. Our software helps avoid easy or systemic errors as well as storing documents long term. 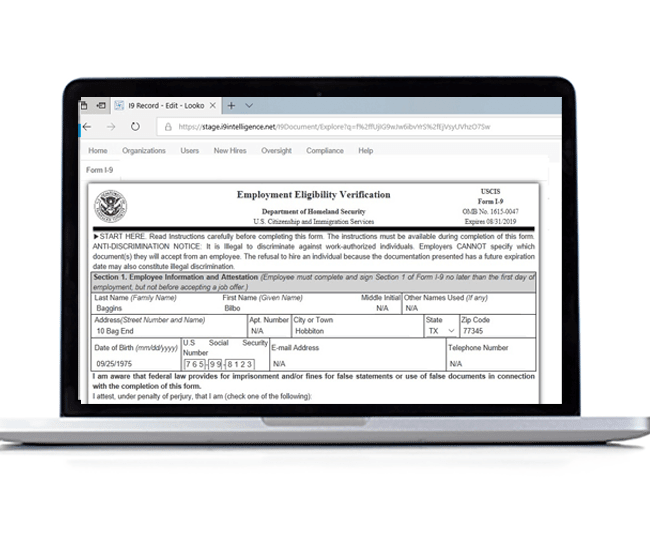 Written by immigration attorneys, this solution addresses all your I9 issues, as well as supports E-Verify, making compliance fast and easy. A forgotten signature or overlooked deadline might not seem like much, but when it comes to employment verification, these small oversights could cost your company valued workers, thousands of dollars and worst of all, its reputation. Lookout Services is here to help. Our I-9 Intelligence software simplifies your I-9 verification processes, alerting you to incomplete forms, reminding you of upcoming deadlines and tracking your documents along the way. With the most flexible platform available, I-9 Intelligence is fully customizable to suit your exact needs. At Lookout Services, we’re here to help you TAKE CONTROL of I-9 compliance. We developed the industry leading software aimed at simplifying I-9 form completion and the employment verification process. I-9 Intelligence, our patented solution, is a safe, secure platform that allows employers to seamlessly create and manage their records and avoid costly audits in an efficient, cost-effective manner. We are constantly improving our technology and refining products and services in order to provide the safest, most up-to-date software solutions available, taking into account all law changes. We hold strong to the belief that building relationships with our most valued assets — our customers — is what keeps us the industry leader we are today. We adhere to our core values of responsiveness, excellence, integrity, and knowledge in everything we do. It’s all part of how we’re here to help you take control of I-9 compliance.